Interested in a Used Truck? Drivers near Minneapolis and St. Paul who are on the look-out for a pre-owned truck that meets all their needs should be sure to stop by the 2018 Used Truck Weekend in Lake Elmo MN at the Fury Ram Truck Center. From June 14 to June 16, 2018 this event will feature a huge selection of used trucks, all with incredible savings. 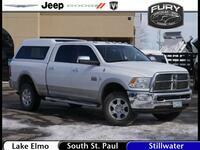 While this special may offer many great used Ram trucks, it will also offer pickups from other makes and models. We will open each day at 8:30 a.m. and be open into the evening. Contact a member of our team or fill out the form above for more information. June 14 open 8:30 a.m. to 8 p.m.
June 15 open 8:30 a.m. to 6 p.m.
June 16 open 8:30 a.m. to 5:30 p.m. There will be a special event at the Fury Ram Truck Center on the Saturday of the Used Truck Weekend. Join us and 93X sometime from 11 a.m. to 1 p.m. and get a chance to get tickets for the Independence Cruise! You can find out more details below. The Fury Ram Truck Center Used Truck weekend will feature the options that truck owners crave, at prices that can’t be beat. Don’t delay, swing by today!